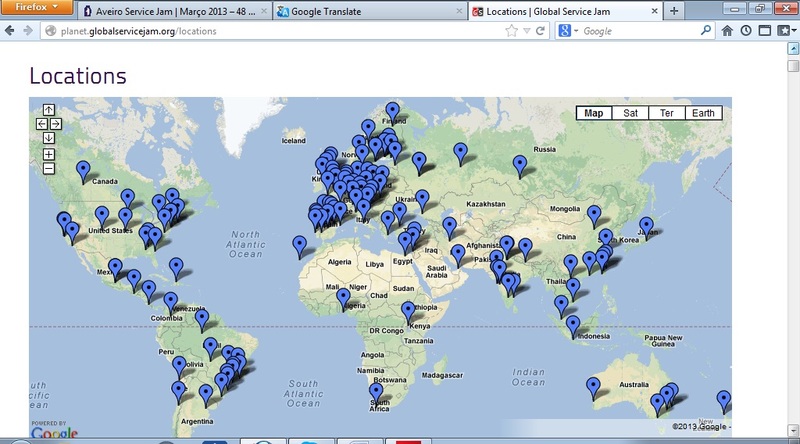 I attended the Global Service Jam in Aveiro, Portugal, 1-3 March. This city was one of 120 locations around the world where over 3,000 people ‘jammed’ together to design over 500 concept services. This amazing ‘happening’ is the brainchild of Markus Edgar Horness and Adam StJohn Lawrence, founders of Work Play Experience, a service design innovation and customer experience consultancy. Over the 48 hours of the jam, Markus and Adam encouraged and cajouled all the participants to deliver their final video presentations and meet the deadline. Their energy levels and commitment were fantastic. After the initial introductions at the Aveiro Service Jam by Gonçalo Catarino and Marlene Amorim, both from the University of Aveiro (IUEA), I asked the participants a question, “What does ‘service’ mean to you?”. We made a ‘word circle’, a lexicon of their notions about service, to gain an understanding of collective and individual terminologies. ‘Hot’ words, with many lines (1) were ‘empowering’, ‘experience’, ‘mutual exchange’, ‘organisation’, ‘improvement’, co-operation’ and ‘community’. Interestingly this feels more like the language of collaborative service design rather than that of a straight commercial service. If this was the opening ‘groupthink’ how would it spill out into the response to the Global Service Jam theme? With more than a touch of irony the overall theme for the Jam, “grow”, was announced by a team in Helsinki! And here was I thousands of kilometres south! After the announcement of the theme there was a momentary sense of anticlimax until it sunk in, then suddenly the activity commenced. People brainstormed in teams, the whole room buzzing with conversation and bristled with post-its. After a short coffee break, the organisers went around the group tables and looked for some possible ‘sub-themes’. 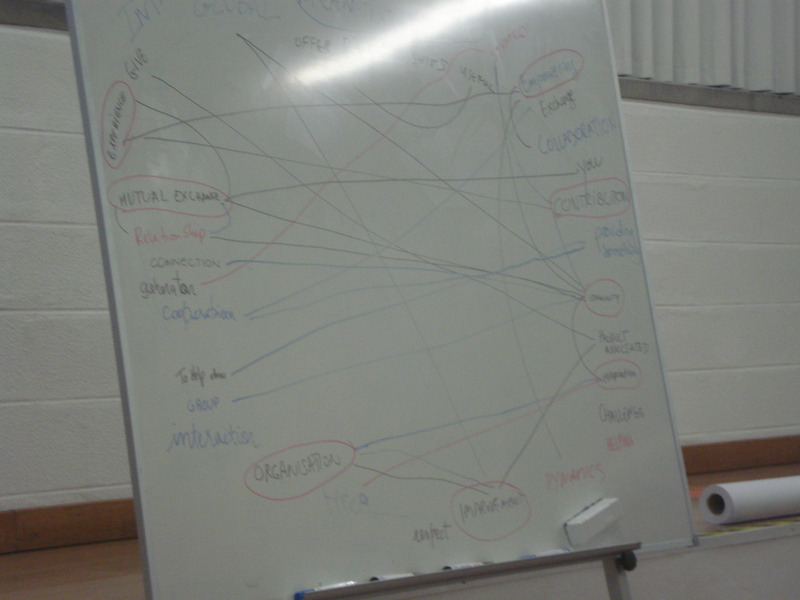 After ten or fifteen minutes, six sub-themes emerged and the individual table of people were re-mixed into new groups. Once formed these groups hit the ground running, generating some seriously positive energy brainstorming their sub-theme around ‘grow’. 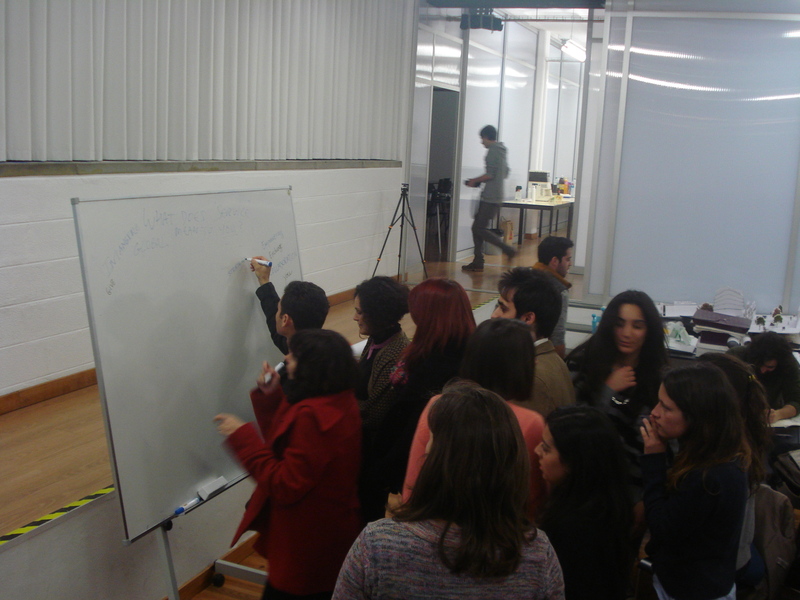 Teams worked throughout Saturday selecting some promising ideas and developing them further. They were supported and mentored by Celso Caravahlo, a marketing manager who operates the Business Incubation Unit at the University of Aveiro, and Gabriela Marques, a co-founder and project manager of Massivemov, a funding platform for creative projects from entrepreneurs, start-ups and companies . I rejoined everyone on Sunday morning after a bright and breezy drive from Porto in the north. I could sense a little bit of tension in each group as the deadline for uploading their video presentations rushed towards them. Talking to most of the teams it was clear they were all struggling a little bit to find the right language and ‘pitch’ to craft the most convincing story about their service. It was clear that for many it was their first time designing a service, so even basic knowledge of a ‘service journey’ was missing. However, and most teams benefited from rehearsing their story and receiving some gentle critique and encouragement to refine them. Five key service design concepts emerged from the teams at Aveiro: PiM, gream, MOW, os macacas and iD Love. Jams at Coimbra and Lisbon generated 2 and 5 concepts respectively. 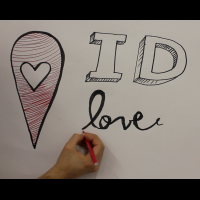 My favourite concept was iD Love, “Exchanging Cultures”, which was a web platform for ‘finding and exchanging traditional items (objects) for free’, developed by Amalia Miranda, Daniel Pera, João Arruda, Manuel Soares and Ricardo Martins. In their own words iD Love grows ‘a worldwide community of traditional objects exchange, growing knowledge and interest about different cultures’, each item exchanged embedding a personal and cultural story. Each object has an embodied meaning reinforced by the story told by the gifter. It is a wonderful way to learn about other cultures and personalises the significance of each object, adding value and extending its lifespan. Reflecting on the overall design processes of the service jam there seemed one rather critical omission – service users and service suppliers or partners were not present during the jam, which meant that someone in the design teams had to represent these ‘absent co-designers’. Converting many of these concepts into realities therefore presents a challenge, although the creative energy that went into them is undeniable. And, much fun was had along the way. I would not be surprised to find service design agencies trawling through the concepts for stimulation, although they should take note that works are licensed under the Creative Commons 3.0 Share Alike Unported License which means the work can be shared and adapted, with attribution to the originating team, but may not be used commercially. 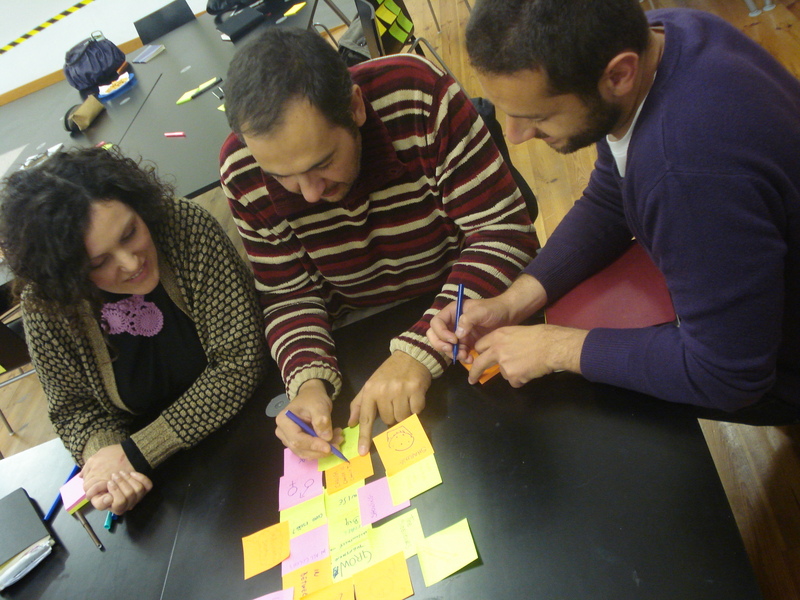 The next event scheduled by Service Design Jam is scheduled in June 2013 for Global GovJam. Sounds intriguing! (1) In the participatory, democratic spirit of a word circle, each person joins up any two words with a line. The more lines to each word the ‘hotter’ the word. On your point about access to service users: many Jammers around the world get out on the streets – especially on Saturday – to test their initial ideas and then their prototypes with real people. Thanks Adam. I appreciate it is a really energetic and positive 48 hours, and that some teams get out to canvas their ideas with ‘real people’. I guess I am saying that Global Service Jam could go up a gear by finding a format to engage communities (of place, of interest, of circumstance…) so that MORE of the concepts can become a reality and, so, challenge ‘what happens next…’. I applaud the fantastic shared creativity of the Global Service Jam and spirit it embeds. Let’s amplify its capacity as potential ‘change agent’ to ‘co.future’. Thanks for Faciliating the Jamming! The Jammers publish their projects under Creative Commons licensing, so they – or anyone else – can take them forward. It does happen. But the projects are not the main focus of the Jam at all. The name “Jam” was chosen carefully, in reference to musicians jamming. A musician does not go to a Jam to record an album. To do that, he picks his band, writes his songs, and books a studio. He goes to a Jam to motivate himself, to learn, to see if he can keep up, to meet new collaborators, and have a great time. Maybe someday one of the grooves which comes out of a Jam will make it onto an album, maybe none will. But that’s ok, because the point of the Jam is the Jam. Put another way, on a very pragmatic level – most Jammers have jobs or schools to go to, they are not looking to start a new organisation on Monday morning with a bunch of guys they only just met. There are start-up weekends, incubators and boot camps if that is the goal. The Jam is further forward in the innovation process. We have data from the GovJam which shows: the Jams produce some projects, but the same people, in the weeks and months after the Jams, produce MANY more real, viable projects out of the ideas, discussions, and contacts made at the Jam. It’s not the projects from the Jam which are interesting – it’s the projects which come afterwards. PS Small correction, the Secret Theme of #GSJam in 2013 was not “grow”, but “grow⌃”. A small difference, but one which led many Jammers along interesting paths.